Polbase - Reference: Crystal structure of the large fragment of Thermus aquaticus DNA polymerase I at 2.5-A resolution: structural basis for thermostability. The crystal structure of the large fragment of the Thermus aquaticus DNA polymerase (Klentaq1), determined at 2.5-A resolution, demonstrates a compact two-domain architecture. The C-terminal domain is identical in fold to the equivalent region of the Klenow fragment of Escherichia coli DNA polymerase I (Klenow pol I). Although the N-terminal domain of Klentaq1 differs greatly in sequence from its counterpart in Klenow pol I, it has clearly evolved from a common ancestor. 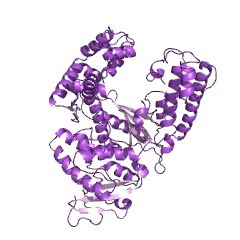 The structure of Klentaq1 reveals the strategy utilized by this protein to maintain activity at high temperatures and provides the structural basis for future improvements of the enzyme.